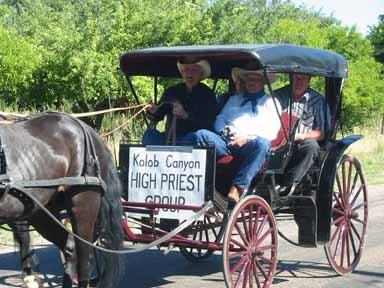 Busy day-left early about 8 am to travel to New Harmony-a small town nearby where we used to live for the annual Pioneer Day's parade. 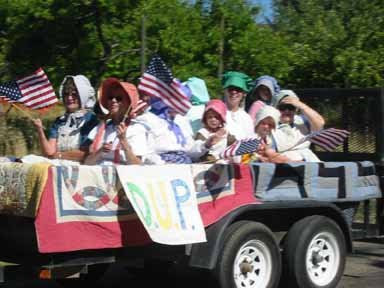 Had a fun time visiting old friends and riding in the DUP-Daughters of Utah Pioneers' float-see above photo. I started this group six years ago when we moved to New Harmony as they didn't have one. We had a wonderful camp of about 24 women who participated in keeping alive the memories of their pioneer ancestry through different activities such as-lessons, field trips, service projects and social events. A fun group of women and it was good to see them again. The actual parade took about 45 minutes to get organized then it was over about 15 minutes later. Seems there were more in the parade than spectators. Then the church had a BBQ with hamburgers and a program. Fun day. This was very interesting. I had to go look up the term "priest" in your faith. Oh wow! This is so neat, Lin. We had something like this for 4th of July in Illinois. It was always so much fun. P.S. I'm so glad you had such a good time in Hawaii, Lin. I hope the humidity wasn't too bad for you. It amazes me what they make leis out of these days. Good for you, Lin. It's wonderful you share a love of history and help keep it alive. Ahhh yes! The "Good Olde Days" in New Harmony with parades and pancakes in the Park. Where else can you go to watch a 91 year old tap dance? Fun memories. Is the D.U.P. group still going strong without you? Who's the new captain?